Hi everyone! 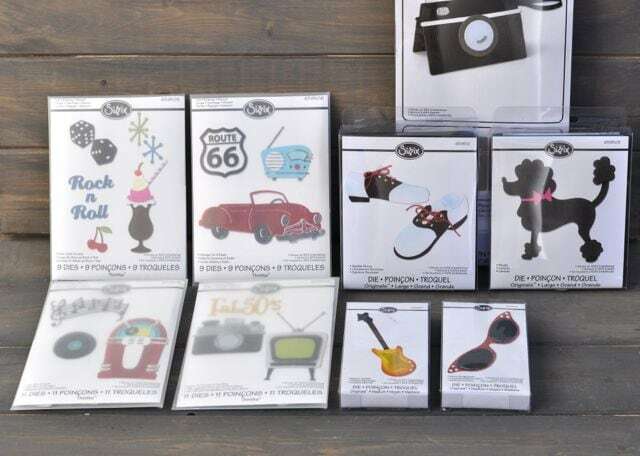 Today I’m excited to be the part of a Sizzix Blog Hop to celebrate The 50’s, a groovy new collection of Sizzix dies created by the talented Jen Long! Grab a soda pop, put on your blue suede shoes, and get ready to rock and roll with this fun project! So I decided to use a LOT of them to make a cute Shrinky Dinks Charms Bracelet! Did you know that you can use your Sizzix dies on shrink plastic? The size of the cut dies were just perfect for shrinking and turning into cute little plastic charms. This is a craft project that is great for adults and kids alike. I’m not going to lie, it’s pretty magical watching those thin paper dies twist and turn in the oven, only to end up perfectly flat when completely baked. Keep reading for the simple directions! Various The 50’s Sizzix dies by Jen Long. 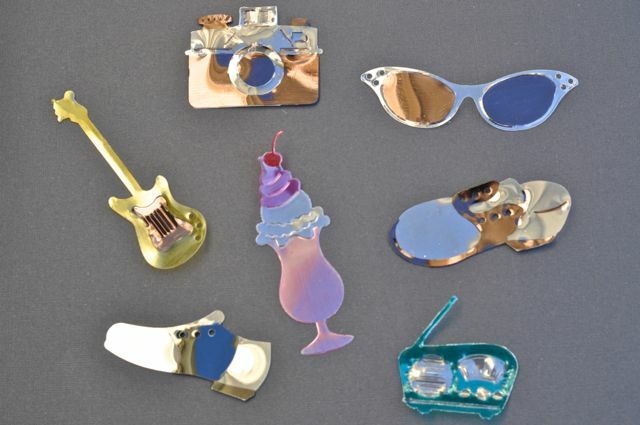 I used the retro sunglasses, electric guitar, camera, saddle shoes, vintage car & radio, and rock n’ roll sundae sets. Die cut your desired shapes out of the shrink plastic using your 1950’s dies and your die cut machine. Once you have your shapes, use the Sharpies to color them in. Just remember that the colors will get darker once they are baked! Punch a hole in the top of the dies, so that you will have a hole for your jump ring to attach to the bracelet. Preheat the oven. Bake your 50’s die cuts according to the directions on the back of the package. I only baked two or three charms at once. While the charms are baking, you might freak out when they start to twist and turn. I know I did my first few times! It’s okay, I promise it will look good at the end. Bake for the recommended baking time, and carefully remove from the oven. Use a spatula to press down on the top of the charms and make sure that they are perfectly flat. Let cool. Spray or brush on a clear sealer to protect the color of the charms. Using pliers, open some jump rings by pulling them apart sideways. Use the jump rings to attach the 50’s charms to the charm bracelet. If you don’t have a charm bracelet already, it’s easy to make one! Just buy some silver chain (from the craft store), and add a jump ring with a clasp at the end. If I can do it, so can you! Isn’t this bracelet fun? I love how easy it was to make with these amazing dies! 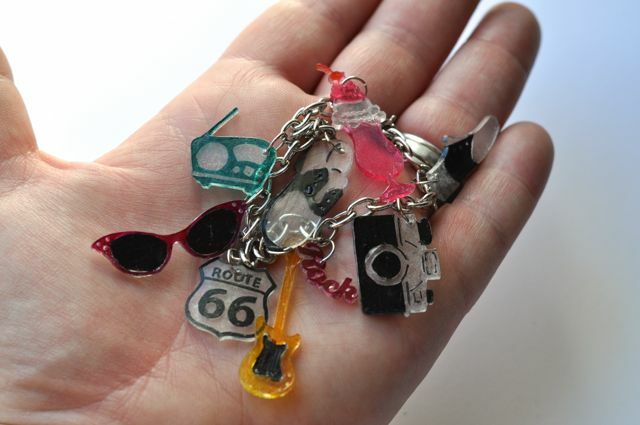 I have a fun 50’s sock hop party that I’ll be going to this week, and I can’t wait to show off my new 1950’s Shrinky Dink charm bracelet! If you liked this project, I would love for you to follow me on Facebook, Pinterest, Instagram, and Bloglovin’. Thanks for following! Hi! I'm Laura, owner and creator of Make Life Lovely, a creative blog filled with creative craft tutorials, DIY projects, party tips, holiday ideas, home decor, and so much more! Make Life Lovely is dedicated to making everyday life more lovely, and I hope to inspire you and show you how! Yes, it is so fun to have all those little charms dangling on my wrist. It reminds me of the good old 80’s when I was little and wore those plastic charm bracelets that were so popular! This is a wonderful project to try. Thank you for sharing. How stinkin cute is this!! I love this set!! Thanks Pam, I love it too! There are so many different things you can make with all of these amazing dies. I’m thinking I need to throw a big 50’s party using all the new dies!! Cute bracelet. Love the 50’s theme. Absolutely adorable Laura!!!! Wonderful idea!!!!! Thanks Jan, I appreciate your sweet comment! I love finding new uses for my Sizzix dies! great project! It’s the most! OMG you are a genius! Why do I always forget the 8 metric tons of shrink plastic in my closet?? LOL. Very adorable! Haha, 8 metric tons?! You have a lot of charms to start making! 😉 So glad you like them!! This is awesome! Thanks so much for sharing this super fun project. Great charm bracelet.. I think shrinky dinks is a great idea! Awesome project 🙂 Love the 50’s!! I actually had a 1950’s car at one time. 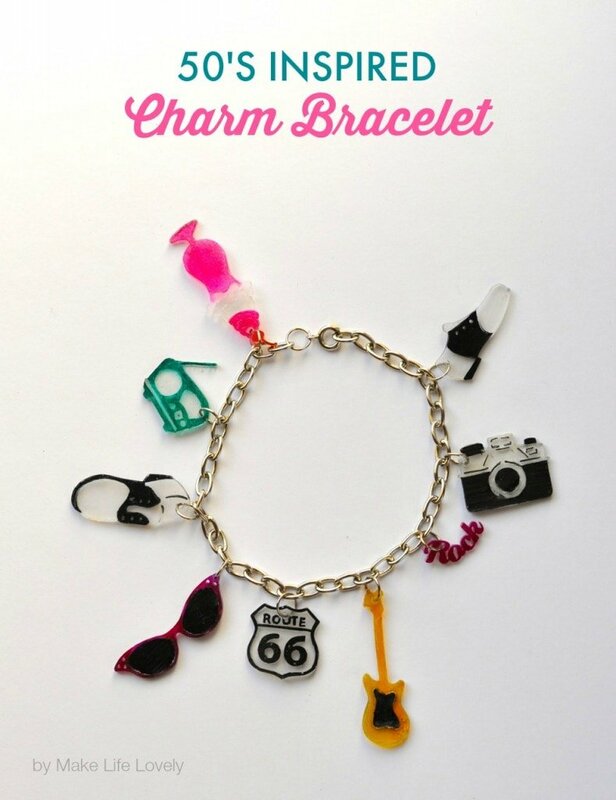 Love your charm bracelet idea! Oh wow. I love shrink plastic, what a fabulous way to use the dies. I forgot about making these. I have the materials to do it. thanks for refreshing the idea. I had no idea!! This is AMAZING!! Can’t wait to try it!! What a cute charm bracelet, thanks for sharing! Great bracelet! Thanks for sharing!! 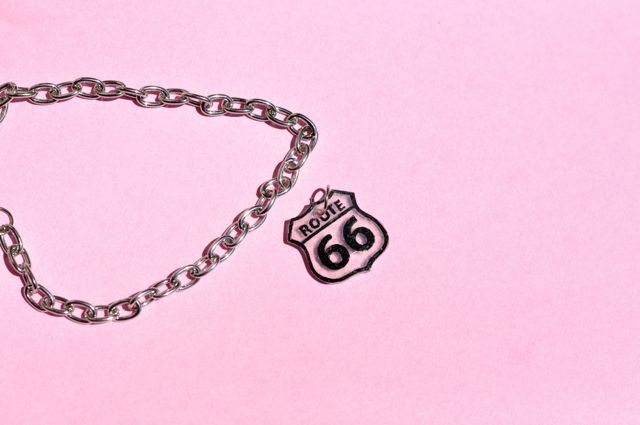 Your charm bracelet rocks! Love how you used the shrinky dinks! What a great gift idea!!! very fun! Your bracelet is very cool. I never would have thought to use shrinky dinks. Oh my gosh, what a fun and creative way to use these dies! I would never have thought of something so clever. What a fun project! 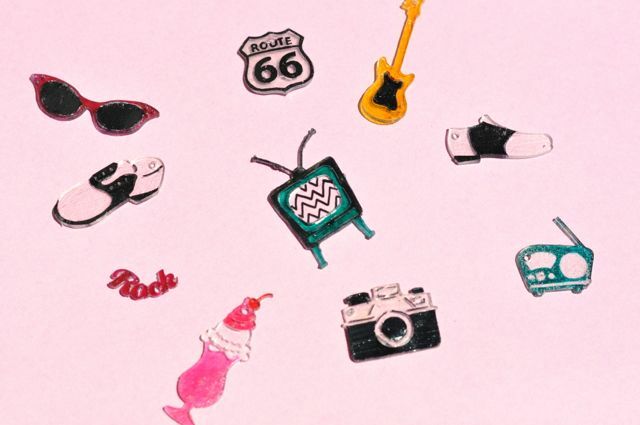 love these 50’s dies and they look so cute in miniature!! Too cute!! Love your sun glass charm! Very clever idea! Oh Laura, your bracelet is Super Cool! Are those words from the 50’s? I know someone from that era who uses Super in just about every sentence. 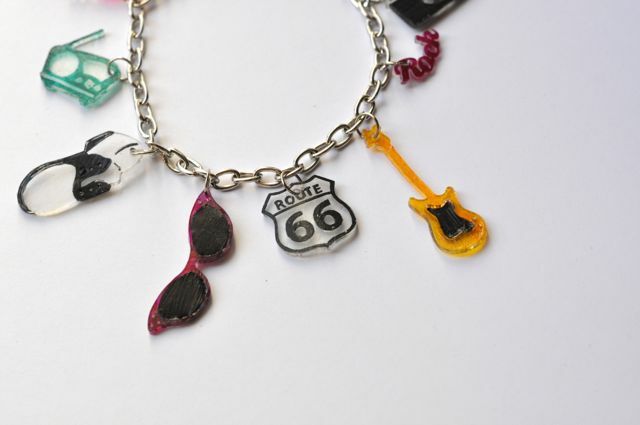 LOL I love your bracelet, what a great tribute to the 50’s and a fun way to use more than one set of the dies. Soooooo cute! These dies are really cute 50’s icons. Perfect for your 50’s dance! Adorable charm bracelet! Great project! The dies are fabulous! Oh my gosh how cute! I love the saddle shoes charm! This is cute! I didn’t think about Sizzix dies being able to cut shrink plastic. Great idea! HOW fun is this? I am from Louisiana and I originally thought, “What a cute hurricane glass” now upon closer inspection I see that it is an ice cream soda glass. Guess you know where my mind is. Too cute…cannot wait to get these dies. Thanks for the tip about uses the die cuts to cut shrink plastic!! What a great idea! Love your bracelet! Shrinkie dinks are so much fun – well done! How to Fix Any Broken Powder Makeup… Really!